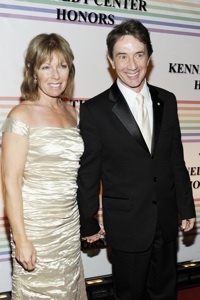 Martin Short’s wife of 30 years, Nancy Dolman, has died. Nancy Dolman, who Martin Short wed in 1980, passed away at home of causes not yet released by the family or medical team. However, it is known that Nancy was diagnosed with cancer in 2007 when doctors discovered a growth in her pelvis. Medics responded to an emergency call at Short’s home in Pacific Palisades, California, on Saturday morning. They were on the scene for a half hour but did not transport anyone, leading to the belief that Nancy died at the house. Dolman was a Canadian actress who gained fame for her recurring role on the controversial sitcom Soap, Second City Television and Custard Pie. She met Martin Short during a 1972 Toronto production of Godspell, where she was the understudy to Gilda Radner. Short dated Radner first, but took up with Dolman in 1974. She retired from showbiz in 1985 to focus on raising the couple’s three children: Katherine, now 27, Oliver, 24, and Henry, 20. The family has not yet released a statement on Dolman’s death. Check back with SheKnows for more as this story develops.